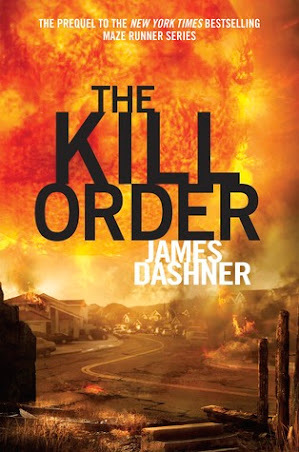 The Kill Order [Book Review] – my books. my life. Before The Maze. Before WICKED. Before Thomas was Thomas. Solar flares wreaked havoc on the world, decimating organized society as we know it. Mark and his band of survivors have made it from New York City to the mountains of North Carolina. But one day everything changes. People start getting sick. And Mark and the others go looking for answers. After finishing The Death Cure earlier this month, I was happy knowing my time with its world wasn’t done. Unfortunately, The Kill Order doesn’t quite live up to the rest of the series. I really enjoyed the parts of the story that explained what happened to Mark after the solar flares, told in dream flashbacks. But the main story, which takes place a year later and starts with the outbreak of The Flare left me unimpressed. And in the end, I still had many questions about this world – questions I thought this book would answer. I also spent the entire book waiting to see how these new characters were related to the main characters in the series only to be disappointed when there is no connection at all. That is not a spoiler. I am simply saving you from that same disappointment. If you’ve read The Maze Runner series, this one is worth reading, but lower your expectations a bit before starting it. Hey, just came across your site and found that your reaction to The Kill Order was exactly like mine. I liked the way he added the dream flashbacks, leaving cliffhangers each time he woke up. But, I was hoping there would be more about the forming of WICKED and I too really hoped the whole way through that those people would be connected to the people in the original series somehow. Like maybe we’d find out Deedee was someone we had already met, or their mother, or something. It is revealed in the end that Deedee is Teresa. At least my copy of the book had an epilogue where it shows Thomas and Teresa meeting for the first time (Teresa around age 7 and Thomas a year or two younger). They exchange stories about being immune, and Teresa confesses to being in the WICKED establishment for two years and that her name used to be Deede. Ah, THAT’S the connection I was looking for. I guess the advanced copy I read didn’t have that epilogue. Thanks! Oh good to know. I heard that the books from (Barnes and Noble maybe?) had an extra chapter at the end. I got mine as an audio book and it ended with Thomas being taken from his mother. That’s ridiculous that they kept that out of so many copies. That’s a crucial point. So by the end of the book, I had figured that Deedee had to be Teresa on my own, but I wish my copy had had that extra chapter! Like you said, it is crucial that people see that these Deedee is Tereasa so people can see the connection. All copies should have had the last important chapter. I hate it when the last book in series doesn’t live up to the rest of the books, and it sounds like that is what happened here. I can’t say I will be rushing out to buy this one right away, but since the kids want to read the complete series, I will be getting this one at some point. Sorry that your hopes were dashed with this one. So who was Thomas’ mother, and what happened to mark and Trina? Why did wicked come after Thomas? This book left more questions than answers. Boo! *spoiler* Mark and Trina die when Alec crashes the Berg into the building. How do u know that?? (spoiler alert) This book irked me. I wanted to know more about how WICKED was started and why Thomas and Teresa were so important and more about the making of the maze and such. I also would have liked to see a part about how Thomas and Brenda were fairing after they settled. though i liked the story line I felt it was slow. The ending also aggrivated me, what happened to deedee (teresa) after she went through the flat trans, did trina fully remember mark, did they die… so many unanswered questions. However I liked knowing about the sun flares and the character builing of Mark and Alec. Based on how the series talks about how Thomas and Teresa helped Wicked, she was probably trained by them untill her role in The Maze Runner.Also, yes all of the main characters died (Marc,Alec,and Trina) after the berg was crashed. Also,based on the way Trina talks to Mark at the end I’m pretty convinced she did ;if not fully, reconize Mark somewhat. I know you guys are disappointed but honestly I think it was pretty much explained. Deedee was sent through the flat trans with the note. Everyone at the PFC must have realized the importance of this immunity Deedee had and started acting on it. This must have lead to the creation of WICKED. It consists of the same people from the PFC because it mentions some names in the epilogue that were the same as on the work pad Mark found. It just takes some reasoning to but I think it was explained pretty well even if it wasn’t THAT specific. I thought this book was very good I did not catch the Brenda and Alec relationship so thank you but I do think the story adds up I mean they survive all this and are forced to put deedee also known as Teresa to help in the future, to create a cure and that’s what started wicked and it leads to all the story before it and for all you people with all your question I’ve heard there making another book called the fever code and its when Thomas and taressa create the maze. Anyways this book was great and I enjoyed it. *Spoiler Alert* Sorry it’s so long… I just finished reading The Kill Order and i have to say i have many mixed emotions about it. Overall, it was a great story. Lots of action and lots of information that i felt was needed after reading The Maze Runner trilogy. The ending however left me with questions… Part of me wants to fully believe that Mark and Trina were Thomas’ parents, but some find that hard to believe since its speculated that they both die when Alec crashes the Berg into the building. But here’s a thought that i have: what if, and i’ll say it again, WHAT IF Mark and Trina didn’t really die like everyone says they did? What if at the very last second, when Trina remembered Mark’s name, hope filled up inside him and he decided that they should both walk through the flat trans? It’s not completely impossible. My opinion is that although Mark, Trina, and Alec’s story was amazing, what was the point of their story if they had no connection at all to Thomas? Maybe the point was simply to show how Teresa came about? Maybe, but once again whats the point because she ends up dying as well. It’s just weird. But now i’m thinking about the age difference between Teresa and Thomas. Mark stated that Dee Dee (Teresa) was no older than 4 years old. Two years later at WICKED, it’s stated that Thomas is two years younger than her. So if she really was 4, that would have made Thomas about 2 at the time, which completely eliminates the possibility of Mark and Trina being Thomas’ parents. But i really do believe Alec was Brenda’s father, here’s why. During the story Alec told Mark, “if wishes were fishes.” That is the exact same line Brenda told Thomas in The Scorch Trials and she told Thomas “it’s something my dad used to say.” That can’t be just a coincidence. Alec did say he didn’t have any children but he could have just been lying so that way he could stay strong and not think of the past. Those are just my opinions. yh i totally agree with the alec was brenda’s dad thing i was very surprised more people didnt catch tht part but the reason mark and trina didnt go through the flat trans was because they were infected with the flare. going through would be counter productive because they would infect all the scientists who(whom? im not sure) would help deedee and they were terminally ill anyways. and alec and mark spoke about this before how they wouldnt want to die going crazy from the disease and would rather die on their own terms like suicide.